I finished the first of the memory quilts made from my grandfather's western shirts this afternoon. This quilt will go to my Dad, and I could not be happier with the way it turned out. When my mom first mentioned that my grandmother wanted me to make quilts out of western shirts, my immediate thought was "how am I going to make it cute??" Although I'm not a typical girly-girl, western plaids are certainly not fabrics I've ever attempted. That being said, I knew it was important to her, and that my Dad and uncles would really appreciate these mementos of their father. Like I said, I am so pleased with the way it turned out, that I couldn't resist a little bit of cheesiness in the photos, and pulled out my extremely old cowboy boots for the photo-op. They look right at home next to this quilt, and I'm totally embracing the cheese. 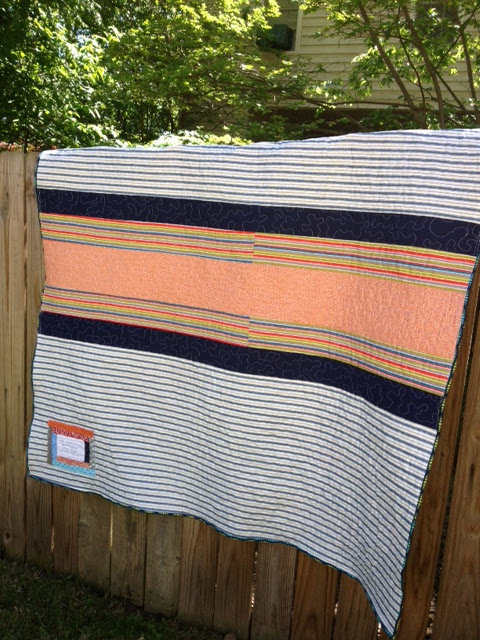 I backed the quilt with Kona Coal and put a wide stripe of chambray through the middle. I stippled the quilt with tan thread to blend with the sashing (Kona Parchment) on the front, but gave a nice contrast on the back. I have to say that this wasn't the easiest to quilt. Although these look like all flannels, they aren't. They are men's dress shirt fabric. Some of these shirts were very soft and thin, so it made it tougher to quilt (and now that we're on the subject, a real pain to piece too). I chose Kona Rich Red for the binding, and I think it just sets the whole thing off. *by the way, I opted not to use any of the shirt pockets on this quilt. When I laid them out, it just took too much away from the kaleidoscope illusion. Frankly, it's all stitched down and quilted through, so at this point, it is what it is. I played around with lots of different ways to word it, and I honestly don't think there is a less wordy way to get all of that on there. I love that I've had the opportunity to make this quilt for my Dad (and by proxy, my grandmother), and I hope he really loves the manliness of it. I know he'll appreciate the memento of his father for years to come. And, although I won't pretend that my grandfather was the greatest communicator, I'd like to think that if he were himself, he would approve of what I've done and be proud. 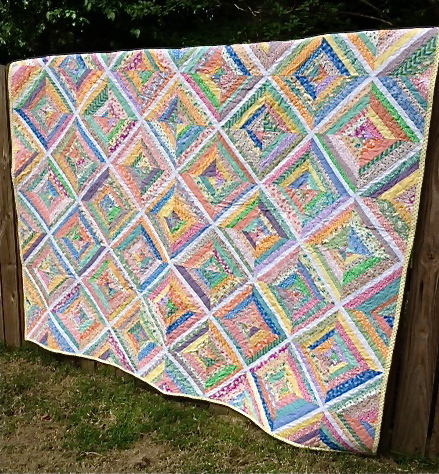 I'm calling this quilt Western Kaleidoscope. I'm entering this in Quilting Gallery's weekly Quilter's Show and Tell. The theme this week is Memory Quilts, so I thought it would fit right in! 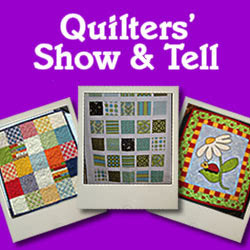 Starting tomorrow (5/31), swing by and vote for my quilt. At the time I entered the quilt, I had not yet decided on a name, so it is titled "PaPa's Western Shirts" in the Show and Tell. As I mentioned in my last post, at my grandmother's request, I am making four memory quilts from my grandfather's western shirts for each of their sons. He is in the end stages of Alzheimer's and I know it will mean a lot to my Dad and uncles to have a special keepsake that reminds them of the father they knew that is technically still here in body, even as he isn't in mind. I just finished the first one and it will be my Dad's. Here is the top all finished. It measures 60 x 60 inches. It is appropriately manly, don't you think? Made from manly shirts, and paired with manly colors (Kona Parchment and Kona Coal). And, just in case you were wondering- I hereby decree that kaleidoscope quilts can be manly as well! Manly?...yes. Quick and simple?...absolutely not. Cutting and piecing this kaleidoscope quilt was by far one of the least simple patterns I've done. I'm not saying it was incredibly difficult, but it just required more careful attention than many other patterns. I don't know if the picture shows it well, but it creates a template for the main triangle pieces, as well as the corner pieces, and it's adjustable for different block sizes. It really helped with the cutting, but the nature of the cuts still meant that it was a bit time consuming. The ruler also came with a set of instructions for piecing the block, and they were really helpful. Apparently it's important to piece the triangles and corners in a particular order, because I accidentally got out of order once with unfortunate results. Again, not a pattern you can throw together mindlessly (sometimes we all need those!). All that said, I really am happy with the resulting quilt top, and I hope my Dad loves it too. I'm planning to back it in the same Kona Coal in the border, and I may play around with appliqueing some of the western pockets somewhere on the quilt. I'm entering this in Quilting Gallery's weekly Quilter's Show and Tell. 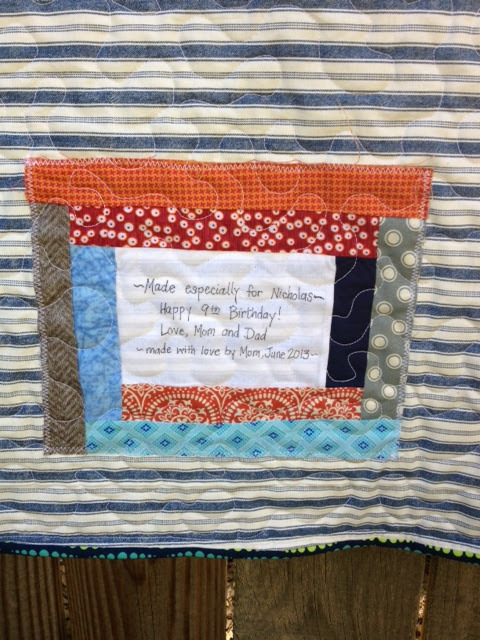 The theme this week is Memory Quilts, so I thought it would fit right in! 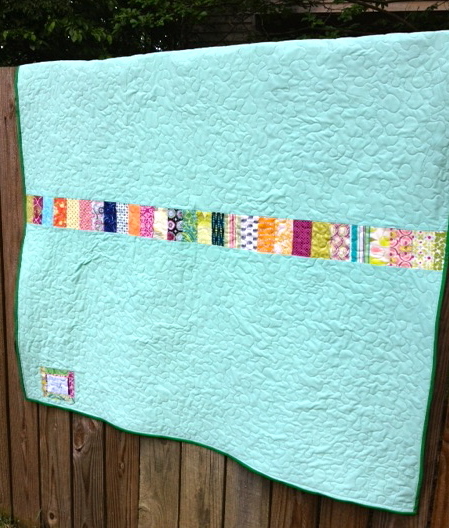 Starting on Friday, swing by and vote for my quilt! While I was in Baton Rouge visiting my family this weekend, I took the opportunity to visit my grandfather, who was recently put in a nursing home and is in the end stages of Alzheimer's. Although he had absolutely no idea who I was and couldn't hold a real conversation, I knew it was important to take the time to see him. I also knew that this might be the only memory that my wild thing has of his great-grandfather. As it is, we haven't lived in Baton Rouge at all during his lifetime, and haven't always gotten to see my grandparents on every single visit. So, I'm fairly certain that this will probably be the memory of him that sticks. In talking with my grandmother about the goings-on of my life, inevitably the conversation turned to my love of quilting. She asked if I would take some of my grandfather's old western shirts and make four quilts- one for each of their sons (including my dad) as keepsakes. Except during the time he was working, my grandfather wore a western shirt, jeans, and boots pretty much every single day of his life; and to know my grandparents is to know that they absolutely do not throw things away. This means that there were closets and closets full of shirts from which to choose, and frankly, it all got a little overwhelming considering I had no idea what I was even going to do with them once I got home. My grandmother helped me choose shirts that were his favorites to make the quilt as special as possible, and of course I tried to get a little color variety as well. I decided to start with just one quilt, and so I only left with 12 shirts. That will keep the project manageable, and I know that my Mom will get more for me when I'm ready for them. I've (finally) decided on a scrappy kaleidoscope quilt with Kona Parchment (a warm tan) as the background, and I'm planning to applique some of the western pocket flaps in the center of the blocks. I've never made this kind of quilt before, so I bought a kaleidoscope ruler, and I'm just crossing my fingers that I get it right! Today was the last day of school for the kiddos, and y'all- I am exhausted! Trying to keep some semblance of order during the last few days of school is like trying to herd cats. You can run around in circles and never get anywhere (and I say that with all the love in my heart). Of course, I have to work tomorrow to finish all of the odds and ends to close out the school year, but somehow, doing all of that without kids in the room doesn't seem nearly as taxing. Hmmmm...wonder why? ;) I am so ready to have the summer to spend with my wild thing at the pool, and baseball field, and to be able to sew until all hours of the night without repercussions (not serious ones, anyway). Speaking of repercussions, I stayed up waaaayyy too late finishing up the stippling on this quilt last night, which just might account for a smidge of my lack of energy today (but just a smidge- it's mostly because of the kids I tell ya!). For once, I actually had a good reason for doing this, rather than just my obsession with all things quilty. My Mom and Dad live six hours away, so they hardly ever get to see my quilts in person before they're sent to their new homes. It so happens that we're heading to visit on Saturday morning, so I wanted to have it finished to make the trip with us. That's a good enough reason in my book! I just finished putting the binding on this quilt (Kona Clover), and I have to say without a doubt- I love the way this quilt turned out! The use of the Kona Iron as my sashing was a bold choice (for me). Ordinarily, I would have picked the much more traditional white sashing, but I think that the gray gives it a little bit of the unexpected, and makes the colors really stand out. I think it also makes it look a little more grown up. For the back, I chose Kona Ice Frappe- what a dreamy color. It's so easy on the eyes, I could just stare at it! With the darker sashing, and colorful coin explosion on the front, a softer color was in order for the backing. But I did include a row of coins to give it a little pizzazz. Something about this gray, aqua, and green color combo feels very fresh, and just makes me happy! I quilted with gray thread to blend with the sashing on the front, and the contrast of the gray on aqua backing looks pretty cool. 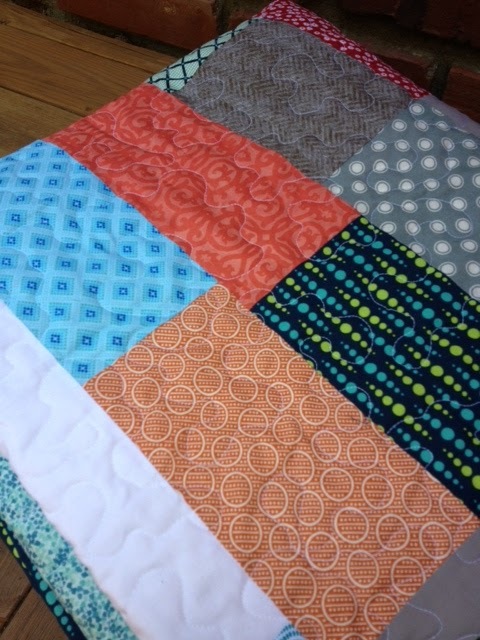 I was pretty worried while quilting, because there's no way to hide little crossovers or thread nests, or any other mistakes that can happen when doing FMQ. It all turned out okay though- actually better than I expected. I've named this one "Coins on the Sidewalk", because the Kona Iron sashing reminds me of concrete- and I think it sounds catchy, ha! Okay, I won't further subject you to the 4:00am ramblings of my brain. But admit it, you're singing along. Don't deny it! That's not entirely true though. I actually love the way that tiny pieces look in finished quilts- like postage stamps or scrappy trips, but again, my lack of patience and desire for instant gratification means that I make larger blocks more often. Anyway, I fell asleep last night thinking about the unspeakable tragedy that Oklahoma is dealing with right now, and so, when I heard a large clap of thunder, I couldn't help myself. I had to get up, check the weather, check on my wild thing, and say another prayer for all of those who have lost loved ones. As a parent and a 3rd grade teacher it literally brings tears to my eyes to think of those parents who can only stare at an empty bed tonight. By the way, I hardly ever remember to take pictures at the beginning of a project, so that pile of coins is already greatly diminished from its beginning number of 240 (teeny, tiny pieces- for me anyway). 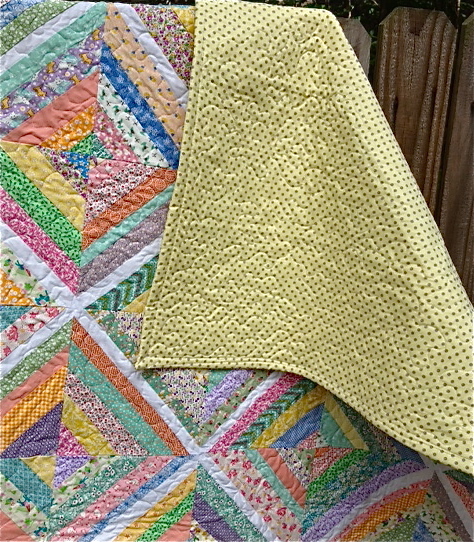 I opted not to do strip piecing for a couple of reasons- first, I wanted a totally random look, and secondly, some of my scraps were too small. So sewing the individual coins into rows took awhile. Longer than usual for me- not to mention the all of the pressing and cutting. 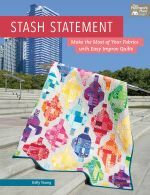 I used a soft gray sashing (Kona Iron) to really make the colors stand out, and turned the short stacks of blocks in alternate directions to add a little interest. I'm thinking about putting aqua on the back and binding in a shade of green (maybe Kelly green? ), and I have a row of coins to go across the back. 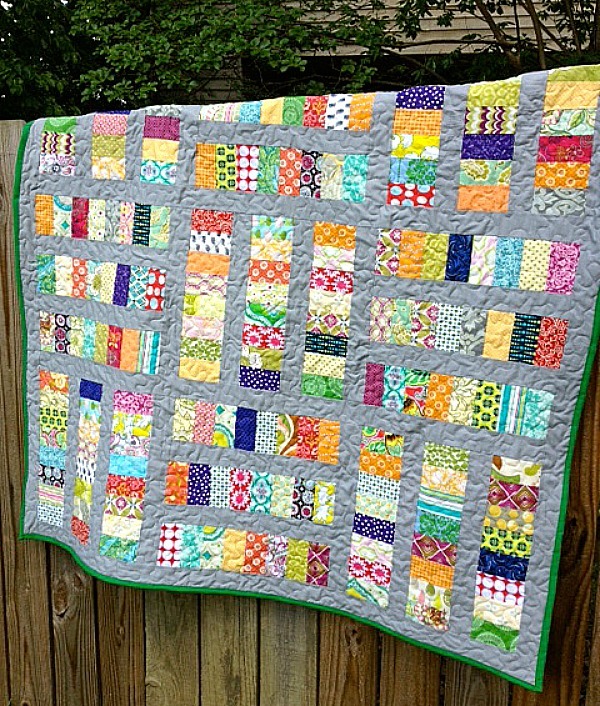 This began as a scrap quilt, (the coins are made from over 60 different fabrics) but I ended up cutting into some of my fat quarters to balance out my colors. I don't know if that makes me particular or a little insane. And really, sometimes, who can tell the difference? 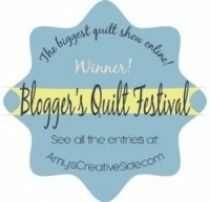 I've been hoping that the Memphis area would get a Modern Quilt Guild chapter for a few months now to meet other quilters around me and share ideas. 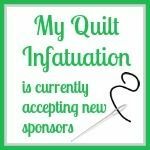 Don't get me wrong, I love the online quilting community and am happy to be a part of it. 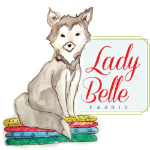 I also know that without it, I would never have been brave enough to tackle FMQ, or some of the other challenges I've mastered recently. For that, I'm really grateful. 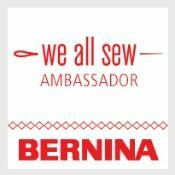 Still though, I wanted to be able to have fun with other quilters, talk face to face, and share modern quilting techniques and fabrics. So, a couple of weeks ago, I was looking at the national MQG website, and lamenting the fact that Memphis doesn't have a chapter, when I clicked on the "find a chapter" button on a whim. 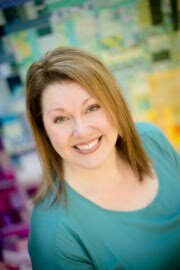 I was absolutely thrilled to find that Memphis quilters had just formed a chapter- yay!! I attended my first meeting this afternoon. It was a "sew-in"- FUN! I just finished the stippling on the Raspberry Limeade Chevron Quilt quilt yesterday, so I prepared the binding (Kona Berry), and took it to work on at the meeting. I also took the Carnaby Street quilt for the show and tell portion. What a great experience! 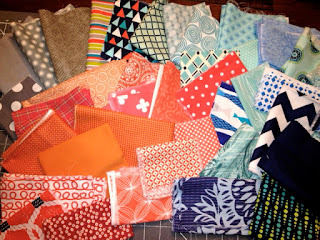 I got to take a peek into the creative process of several talented ladies, all with varying levels of experience, and I got to finish up a quilt of my own- bonus!! My mitered corners are getting better!! 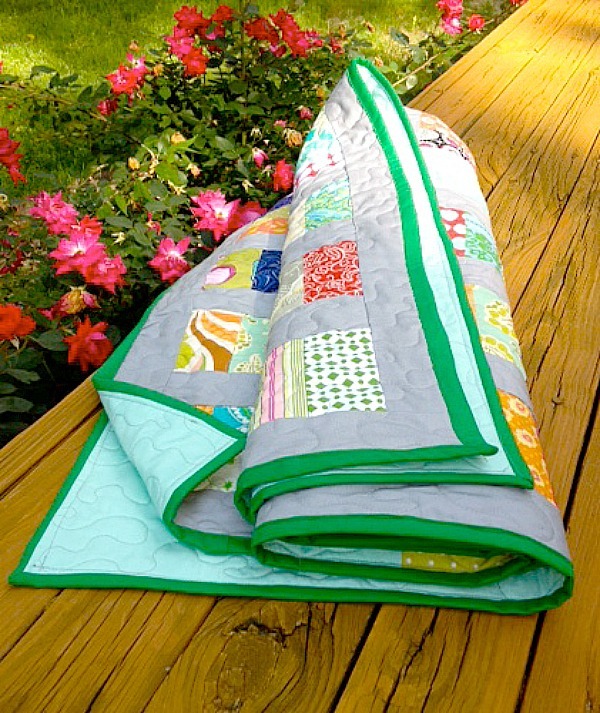 Linking up to Quilt Story's Fabric Tuesday, and Sew Cute Tuesday at Better Off Thread! 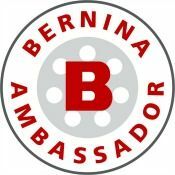 Check out my Link Party page for buttons! even if I did choose a really simple pattern. Here it is all finished! I'm calling it Sailing at Sunset, since the colors remind me of the ocean when it is most beautiful, and because there are a few nautical-themed fabrics mixed in. 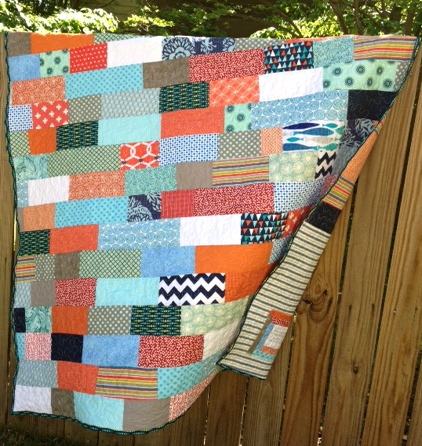 Marathon sewing aside, I'm really proud of this quilt for a few reasons. 1. I've been quilting off and on for almost 15 years, but before this quilt, I have never done a pieced backing. It's not that I don't know how to do one, it's just that by the time the top is all finished, I'm ready to get on with the quilting part and get it done. 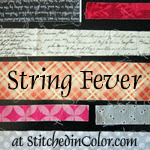 After seeing lots of awesome pieced backings all over the blogosphere (thanks for the inspiration! ), I decided to take the plunge and do one myself. 2. 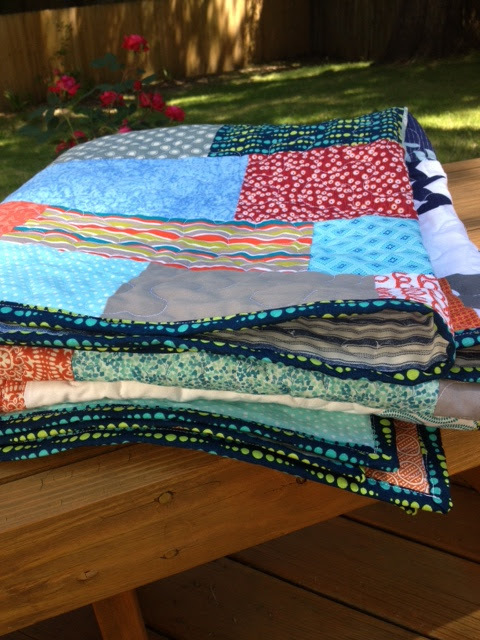 Until this quilt, I've never done a binding. What's that you say? No binding? How did I finish the edges of my quilts? Well, I used the method used by my grandmother, which is called "back over binding." 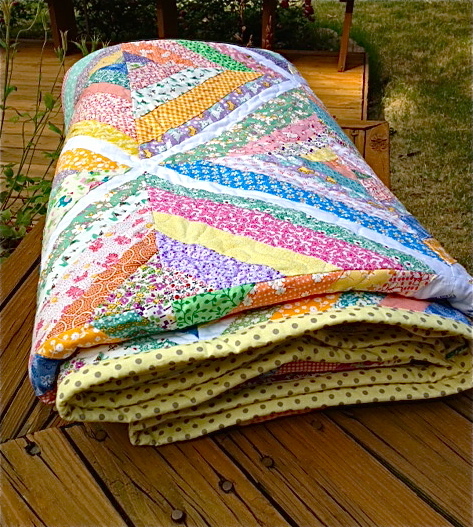 This method involves leaving the backing a couple of inches wider than the quilt top all the way around, and you simply fold it over, tuck the raw edge, and stitch it down, either by hand or machine. 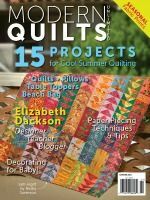 This works great if you've chosen a backing that isn't too busy and will look great against the pattern of the quilt top. Alas, the backing I wanted to do would not have looked good on the front side, so I had to learn a new skill! All in all, I'm happy with it, even though my corners don't look perfect- darn that mitering! 3. My FMQ is getting so much better. I didn't have a single crossover in my stippling on this quilt (yay! personal victory! ), and I felt really relaxed while quilting. Usually, I feel tense while quilting, and as a result I don't think my curves are as smooth as they should be. I know I've mentioned that FMQ is still a new skill I'm working to perfect, and I've had one or two crossovers in each of my last quilts. In this one- not a single one. I'm also working on more even spacing of my meandering lines. It's hard to take a picture of all this, but here's my best shot (no pun intended, lol!). Check out the label I added to the back. 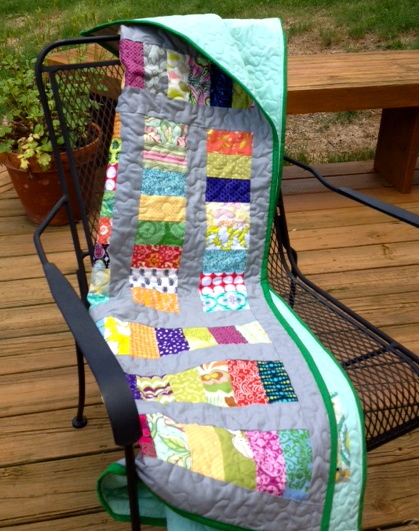 You can see the quilting pretty well in this picture too. To apply the label, I used spray basting to hold it in place, and then appliqued it to the backing after basting, but before quilting (so the stitches wouldn't show on the front of the quilt) with a zig-zag stitch. Have I mentioned that I really dislike hand sewing? I find it tedious, and I don't think that my stitches are as strong as machine stitching. Believe me, if I can find a way to do something on the machine, I will NEVER choose to do it by hand. I have what some (most vocally, my husband) might call a "one-track mind." Seriously- I am not kidding. I have a real problem. When I get engrossed in a quilt, I simply cannot think of anything else. As luck would have it, I had to take my son to the doctor today- he's not sick, or else I would never consider that lucky. Even more lucky, was that his appointment was smack in the middle of the day, so I had to take the whole day off. Darn! I'm sure you can guess what I decided to do with that extra time before and after his appointment. Yep, you guessed it! I finished the Carnaby Street quilt. Yay! After finding the most perfect backing fabric ever yesterday afternoon (check out the picture below), there was no stopping me. Usually I'm an old-fashioned safety pin basting kinda girl, but I took advantage of the dry weather and decided to recruit my husband to help me try spray basting for the very first time (more on that little misadventure another time). Suffice it to say that although it was dry, it was a little breezy, and that made things very interesting. We did however, manage somehow to get the quilt basted successfully without the unwelcome additions of leaf bits and dirt- though not very efficiently. Ha! Again, my complete lack of patience will simply not allow me to wait until it is daylight to take a better picture. Hope you like it! It took me awhile to decide what kind of quilt I wanted to make with such large scale, busy prints. I eventually went with one of my favorite go-to patterns- Square in Square. I felt like this would showcase the fabrics without cutting them too much, and without adding busy-ness (that's a word, right?) to an already busy quilt. I also knew that the pattern I chose would have to fit the mod feel of the prints. To cut the fabric, I used the Stack and Whack method found at Cluck Cluck Sew, but I modified so that my blocks finished at 9 inches. If you haven't used this cutting method, I highly recommend it. It's so simple! Here are the blocks, all pressed and ready to go! After that, the quilt top went together in a snap! I finally got a picture of the fabric in the sunshine and I think it really makes a difference in how the colors show up! Now here comes a tricky part- finding the backing. I'm off to the fabric store to search for a backing that is just right. I have no idea what color family I'm looking for, I'll just have to see what grabs me. Any suggestions? 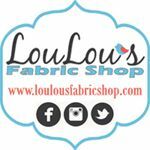 Made By You Monday at Skip to My Lou!